I was recently asked an interview question that really got me thinking. If I was going to cast a movie based on my upcoming release, who would I cast as the hero and heroine? Although I know many authors could answer this question without hesitation, I rarely think of my characters as anyone other than themselves. Sounds weird, I know, since they are made up people but I think of them as their own people with their own faces. Truthfully, when I read, I want the characters to come to life in my head in my own way, not with any comparison by the author to a celebrity. Still, I went with the question and searched the internet in search of faces to fit my characters. The hard thing was that as a forty-five-year-old, my tastes have aged with me and I find men my hero’s age, late twenties/early thirties, to be too young looking. So, I chose a man who is quite a bit older than my hero and a woman who is the same age as my heroine. And for the last week, I’ve found myself hoping the two people I picked don’t totally turn off any potential readers. That is my problem with telling my readers who my characters look like. I guess every once in a while I have an idea of someone they resemble, but I don’t say it. I don’t want it clouding the reader’s imagination. Mostly because there are certain actors I would never cast in a heroes role, but who other women might love. It’s the same with actresses. Have a group of women name their favorite dark-haired, dark-eyed actor, and you’ll probably get quite an assortment. Hugh Jackman? Ryan Reynolds? George Clooney? Christian Bale? Johnny Depp? Each of these men brings a totally different image to mind, maybe not even because of their looks but because of the roles they’ve played or their public persona. So I play it safe. I let the reader decide whose face they want to give the character. I know a writer paints pictures with words, but unlike the artist, I feel like it’s my duty as the writer to step back at a certain point and let the reader bring it into focus with her own strokes of color. As a reader, I really appreciate it when writers do the same for me. 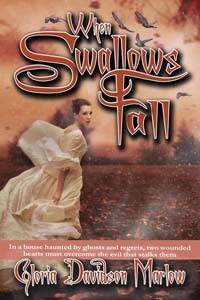 When Swallows Fall will be released November 1. Here is a blurb and an excerpt. Although Ophelia Garrett loved Cade Scott first, it was her sister he married and took home to his plantation. When Ophelia receives word of her sister’s murder and Cade’s arrest, she travels there on a mission to learn the truth. She soon finds the halls of Almenara are haunted by secrets, peril, and quite possibly her sister’s ghost. Despite the cold, angry man Cade has become, Ophelia’s heart refuses to believe he is a murderer. Vowing to do everything she can to prove his innocence, Ophelia must open wounds she’d hoped were long healed and face the feelings that still burn between her and Cade. As everyone looks to Cade as the suspect, evil haunts the dunes and halls of Almenara, bringing death to two more young women and forcing Ophelia to confront the danger. He lifted his head, his face mere inches from mine. Emotion clouded his gaze, and he opened his mouth as if he meant to answer me. Instead, a low moan escaped him and he caught my mouth in the hungry kiss I had dreamed of for six years’ worth of lonely nights. For just a moment, the reason for that loneliness was completely forgotten. A cry rent the air, and I jerked away from Cade, guilt and alarm whipping through me in equal measures as I turned to stare at the maid who had finally returned with the broom and dustpan. “No need for apologies, Susan,” Cade said, bringing the woman’s stammering apology to an end. I was left standing in the hall with the maid, who stared at me with open disdain. Her voice was sharp and cold when she spoke. “People don’t come back from the grave, Susan,” I retorted, hoping my haughtiness hid my shame. If Desi were to come back to haunt the halls of the home where she’d died, I was fairly certain what I’d just done would be reason enough for me to be her target. Thanks for having me here, Leanne! I enjoyed this post. I quite agree. I like to let my imagination roam when I’m reading. If the author give a too detailed description, whether it is a setting of the scene or the physical attributes of the H/h, it takes me out of the story. While it’s important to give your reader some description to guide their imagination, too much hurts the story. Thanks for sharing your thoughts, and thanks to Leanne for having you today!